At a trade show, you need your idea to stand out against your competition. It’s easy to fall into a rut with your example exhibit booths after one too many trade shows; it’ll be tempting to use the same banners and business swag over and over again. Instead, keep people engaged and interested in these fresh ideas for your example exhibit booths. Modern technology: For your integrated marketing displays, you’ll want to make use of whatever cutting-edge technology you have access to. This includes digital displays and video walls that are sure to impress any passersby with your up-to-date use of technology. If you can’t add a digital display to your booth, give those stopping by your booth a chance to use their technology; add a photo booth for Instagram photos, have a hashtag for people to share that they’ve visited your booth, and more. Giveaways and contests: People love the opportunity to win some free business swag, even if it’s just a t-shirt or a hat. These small giveaways can help people remember your brand as well; 85% of consumers remembered advertisers who gave them a shirt or hat. Any item with your brand name on it that’s going to get used after the trade show is another opportunity for consumers to see your brand name, helping you build brand recognition with minimal effort. Trade show survival kit: Trade shows can be exhausting for both those running the example exhibit booths as well as the show attendants. Having additional comforts for people passing by, such as a hydration station or phone chargers, can bring people to your exhibit and keep them around long enough for you to deliver your marketing message. Touchscreen wayfinding digital displays: When trade show guests have spent a good amount of time wandering around, it’s likely they’ve gotten turned around more than once. Having a touchscreen wayfinding digital display can help guests locate where they’re going and give them enough pause to notice your example exhibit booth. 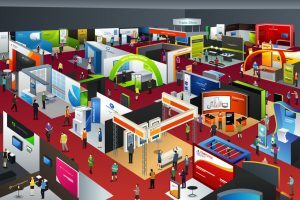 Need more ideas for your booth for an upcoming trade show? Exposyour can help you figure out the best way to draw consumers to your booth, from promotional items to digital displays and more. Contact Exposyour today for more information.